See more of New York ... with SwingStreets! Eager to get off the tourist treadmill? Tired of the passivity and impersonality of bus tours? Want to experience the unique color and flavor of New York without being glued to a motorcoach seat? Guided tours with SwingStreets provide that opportunity. Our walks through New York's most vibrant and historic neighborhoods have special appeal for urban scholars, cultural historians, architecture buffs, music lovers – and curious people in general. What’s your pleasure? Gorgeous streetscapes? Music history? Local lore? Great restaurants well off the beaten path? Quirky museums? We can lead you to hidden treasure in Manhattan, Brooklyn and Queens...and show you the most delightful parts of Harlem and Greenwich Village. Since 2001, SwingStreets has been helping visitors discover the best of the city. Our tours appeal to active folks determined to see, hear, smell and taste the things that make New York the world's most varied and exciting travel destination. 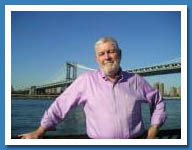 SwingStreets was established in 2001 by licensed New York City tourguide Paul Blair. After having taught school in Africa as a Peace Corps volunteer, worked for a decade as a freelance journalist in Indonesia, hosted a daily broadcast on Voice of America and written about music, food and Americana for at least two dozen publications worldwide, Paul currently edits Hot House, a New York jazz monthly that's been publishing since the early 80s. Now he looks forward to sharing his knowledge and enthusiasm with you on the streets of his favorite city. © SwingStreets. All rights reserved. Site designed by nette.ca. Photos by SwingStreets except Manhattan Bridge by Nyluke, istockphoto.